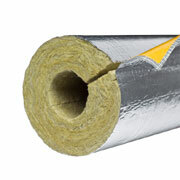 PAROC Hvac Section AluCoat T is a non-combustible stone wool pipe section for thermal and condensation insulation of pipework and air ducts in buildings and ships. It has a reinforced aluminium foil facing and tape in the longitudinal seam which prevents condensation gives a quick installation. PAROC Hvac Section AluCoat T can be used to satisfy the requirements as given in the tables for insulation thickness in BS5422:2009. Paroc can offer help and assistance to customers to confirm that the insulation systems proposed do in fact, achieve the necessary performance criteria. PAROC Hvac Section AluCoat T conforms to BS3958-4.